In a spirit of joyous appreciation, thousands of people gathered on the Mall in Washington, DC, on September 24, 2016, for the dedication ceremony of the Smithsonian Institution’s National Museum of African American History and Culture (NMAAHC). 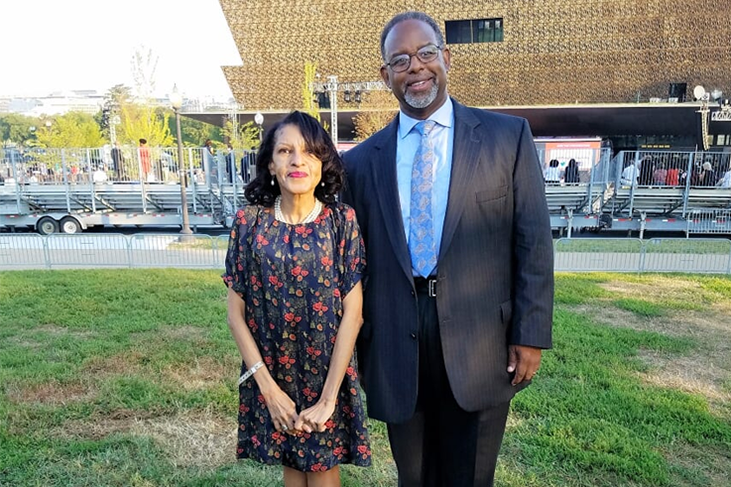 Dennis family descendants, DFCLT President Denise Dennis and Darryl Gore, were among the invited guests present at this historic moment in our nation’s history. President Barack Obama, First Lady Michelle Obama, President George W. Bush, First Lady Laura Bush, the Honorable John Lewis (D-GA), Supreme Court Chief Justice John Roberts, and NMAAHC Founding Director, Lonnie Bunch were among the dignitaries who addressed the invited guests and thousands who stood on the Mall to witness the event. The program included dramatic readings from African American culture by luminaries of stage and screen Angela Bassett, Robert De Niro, Will Smith and Oprah Winfrey, and stirring musical performances by Patti La Belle and the incomparable Stevie Wonder. A national museum to highlight the history and achievements of African Americans was first proposed one hundred years ago. In the 1920s, President Calvin Coolidge signed legislation for a museum, but with no financial support. Eighty years later, during the administration of President George W. Bush, Representative John Lewis and First Lady Laura Bush led the effort to pass legislation for a national museum of African American history and culture. President Bush signed the legislation on December 16, 2003. Built with the support of Congress and contributions from foundations, corporations, African American sororities and fraternities, and countless generous individuals, NMAAHC is the nineteenth museum of the Smithsonian Institution, the largest museum, education, and research organization in the world. Denise Dennis and her mother, Margaret Dennis Crumley, were present four years ago at the groundbreaking ceremony for the museum. Located on a five-acre site steps from the Washington Monument, NMAAHC is a distinct three-tiered building reminiscent of a traditional West African column with a façade of bronzed, canted panels. The façade’s filigree skin, of bronzed aluminum, is inspired by grillwork in South Carolina and Louisiana derived from African design. The museum tells the full story of African American History from the fifteenth century slave trade to the achievements and challenges of today. The 400,000 square foot edifice features approximately 36,000 artifacts including Harriet Tubman’s hymnal and a shawl sent to her by Queen Victoria, Nat Turner’s Bible, a Tuskegee airplane from World War II and Chuck Berry’s Cadillac. Dennis donated thirty nineteenth-century artifacts, selected by NMAAHC curators, from the Dennis Farm. Those artifacts are now a part of the museum’s permanent collection.